Discover interesting facts and information about the weapons, including the Knife Sheaths, used by Native American Indian tribes. Description and Definition of Knife Sheaths: A sheath is a protective covering for a knife. 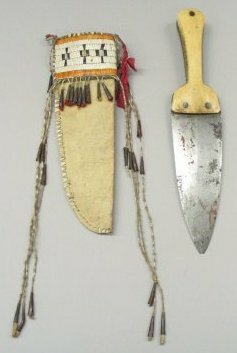 The Knife were one of the most important weapons that were carried everywhere by the Native American Indian. 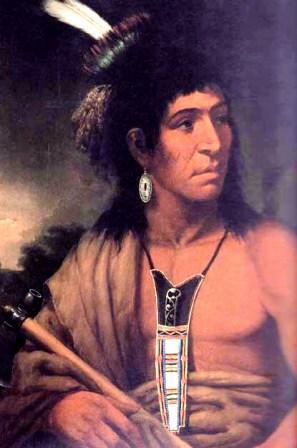 They were held in knife sheaths and generally worn in a sheath around their neck as the above picture shows, or around their waist either sheathed in a knife belt or tucked into clothing. Knives and daggers came in all shapes and sizes, such as the throwing knife, scalping knife, as did the sheaths that held them. 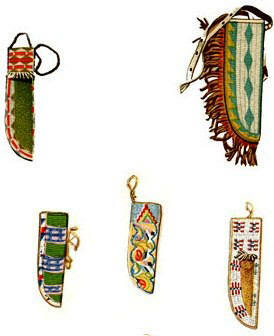 Native American Weapons - sheaths. Discover the interesting facts and information which relate to the History of Native Americans and the weapons they used such as the Knife Sheaths. The pictures on this site show the weapons and tools that were used by various Native Indian tribes that can be used as a really useful educational history resource for kids and children of all ages. We have included pictures and videos to accompany the main topic of this section - Knife Sheaths. The videos enable fast access to the images, paintings and pictures together with information and many historical facts. All of the articles and pages can be accessed via the Native Indian Tribes Index - a great educational resource for kids providing an unusual insight into their culture. We hope you enjoy watching the videos - just click and play - a great resource for gaining facts and information about the life of Native American Indians.